Kinesiology is the study of human body movements and muscle function. All the movements of animals and human beings are studied in this field of science. It also helps to understand the impacts of muscle functions on our health. The term kinesiology has been derived from the words, “Kinesis” meaning “movement” and “Logia” meaning “study”. Let us have an insight on the importance and benefits of kinesiology in our society. Kinesiology is the branch of science which helps to detect the various imbalances in our body, which, otherwise cannot be detected even by the most modern medicines. It helps to maintain the mental and emotional balance of a person. It helps to get rid of the back and neck pains, which is nowadays very common in all the professions. It helps to identify the food sensitivities of our body. The various learning disabilities of a child can be easily cured by using the method of Kinesiology. Over-stress and anxiety are the root cause of many diseases. This can be cured with the help of Kinesiology. Reflexology helps in improving the nerve function, increasing the blood and oxygen circulation in our body, boosting our energy levels, and eliminating toxins from our body. Reflexology reduces the side effects of the cancer treatments like chemotherapy. Reflexology helps to heal all the wounds faster. Acupuncture helps in the treatment of digestive problems, knee pain, allergies, muscle spasms and pain, chronic back pains, migraines, osteoarthritis, and also depression. Chakra healing helps you to stay calm and positive. It is slightly identical to the yoga. The sound therapy helps to cure the different types of problems such as high blood pressure, anxiety, depression, sleep disorders, autism, and pains. The Kinesiology therapy helps to boost the self-confidence of a person. Homeotherapy is used in the treatment of many recurring diseases like skin and joint diseases. Kinesiology also aids in treating stuttering, bed-wetting, and clumsiness in children. Prolonged fatigue or tiredness can also be cured using this field of science. 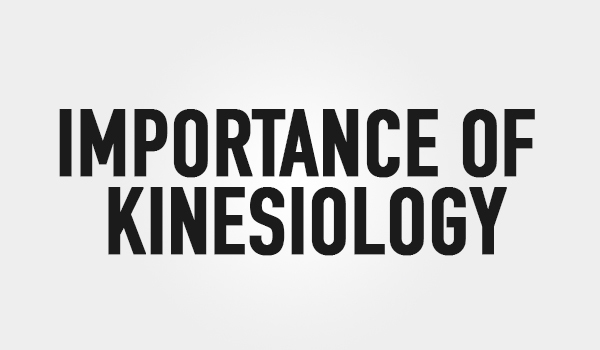 Kinesiology is, hence, very important in our lives. All the human and non-human body movements can be checked and treated using this science. The different types of treatments included in the Kinesiology treatment, help to get rid of all the common problems faced by us in our day-to-day lives. In short, it helps to energize our body and mind equally. Though this field of science is essential to the society, it is not acknowledged by many. For many people, kinesiology is just a necessary educational qualification required to be a Physical Education Trainer. What we fail to realize is that the role of Kinesiology is far more crucial than the most popular medicines.